Sitting by the race track, watching cars go by at enormous speeds, driven by the world’s most experienced and professional race car drivers, is probably one of the most exhilarating experiences one could have – second perhaps only to driving those cars yourself. Of course, there are relatively few professional auto racers out there who are truly masters of the sport; the rest of us are content with being racing enthusiasts and in some instances, race car collectors. There are many different popular auto races today, among them NASCAR–stock car racing that is very popular in the United States–and Formula One, also known as Formula 1, or simply F1, which is traditionally more European, although it is internationally known and respected. In the U.S., the family-owned and operated business NASCAR, which stands for the National Association for Stock Car Auto Racing, Inc., forms the backbone of the most popular stock car races in America. The term “stock car” originally meant that, as opposed to a specifically-built race car, the vehicle was not modified beyond its original factory specifications. In reality, most modern stock car races involve race cars that are built according to the strict specifications of NASCAR, which is the largest stock car racing regulatory body in the world. Formula One, on the other hand, has always featured special vehicles designed specifically by car manufacturers for racing purposes and optimized to be as aerodynamic, fast, and maneuverable as possible. 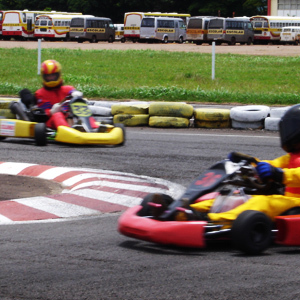 Most past and present F1 drivers, which represent the “creme de la creme” of the car racing world, trained on and became experts at kart racing, or karting, in their younger days.